So when I went out for my run this morning, it was a good time to break out a new nutrition powder to see if I want to use it in my race on Sunday. My normal 5.14 mile run went about the same timewise, but I felt better at the end. I think I’ll use it. The same mantra is terrible for the first day of school, which is what today is in the North Middlesex Regional School District. The first day is the perfect time to try new things. You get new students. You have new tweaks to curriculum. In my case, new teammates. I can’t walk into the room this morning and do the same thing I did the last ten years. I teach 7th and 8th grade math. It’s not full looping, so I have some repeat students, and some that are new to me. My homeroom is full of 8th graders, eager to finally be kings and queens of the school, and it is my job to make sure they have that experience while creating the best overall culture in the school as possible. I relish that responsibility. Today was filled with logistics. New schedules, new lockers, raised expectations in classes. All of which are leading to shaping these students for what they will be for the next 179 days. As a math department, we are trying to be more transparent to the students about the expectations of them, and so that was laid out to them today. I have taken the role of Data Coordinator for my district, and we built a student sheet in our data collection program to identify strengths and opportunities for them. The instruction begins tomorrow. After school, I had a brief video conference with my contact at TeachPlus, which is a non-profit organization that assists with policymaking in education. I am a member of their 2016-17 statewide fellowship, with a focus on regulations on Title II money (for professional development, among other things). This will be a regular part of my year, and I’m very excited to be a part of this work. Now it’s time to help my wife create the decorations for her upcoming Harry Potter-themed birthday party (hers, not a child’s. Hers. ), try and lock down some locations for an Air Jordan release on Saturday, and watch the Red Sox. Then some sleep, and get those students going tomorrow morning. In my classroom, I have eight records that line my back bulletin board. They are specifically chosen to remind the students of the values that strong students and citizens share. 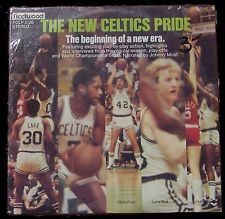 I’ll include one each month - the first is the spoken word album The New Celtics Pride. It is a narrative summary of the 1980-81 World Champion Boston Celtics, but I have it up there for the word “pride”. I want my students to work hard and be proud of everything that they put their name on, from following the prompts and tasks asked of them, to neat writing and presentation. The more pride a student takes in their work, the more improvement it will show over time. Like a lot of what we do in middle school, it’s a slow process, and having reminders helps them keep it in their routines. In my early morning runs, I often have a hint on how my day is going to go by whether or not I beat the train. My loop crosses the same tracks in two places, at 1.6 and 3.1 miles. It’s a freight train, so there’s no set schedule, but it usually comes between 5 and 5.30 am. If I get to the crossing and the train is there, bad sign. This morning, I happily crossed the second section while I heard the whistle in the difference. It was a good day.